Welcome! Many gamers don’t have a large group of people to play with on a regular basis. Our main gaming partners are our significant others, or our children, or roommates, or a co-worker or… well, you get the drift. Whatever the case may be, often times we find ourselves sitting across the table from another person with nothing to do. In this series of articles, we will be turning our focus on some great 2-player only games that can fill that void! 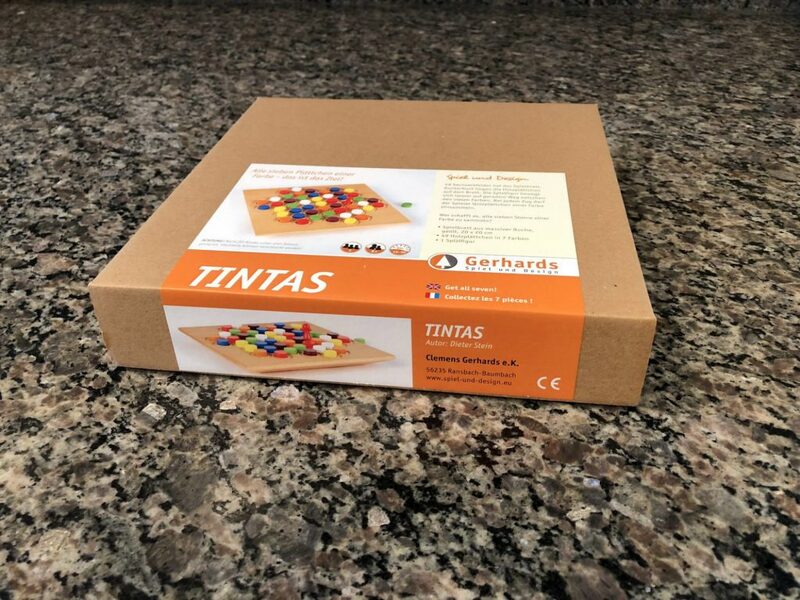 I first heard about Tintas earlier this year when Eric Martin from Board Game Geek mentioned it in his Twitter feed. This German game from designer Dieter Stein not only looked beautiful with its brightly colored discs, but also had a gorgeous hardwood board to accompany it. But oh my, once I watched the overview of how the game was played I knew that I had to find it. After waiting and waiting for new stock, I finally picked up a copy from the only US distributor, The Wooden Wagon, and I’m so glad that I did. Perhaps after you read my review, you’ll be interested in a copy for yourself! Tintas comes with 50 brightly painted and lacquered pieces: 49 discs (7 each of 7 different colors), and a red marker pawn. The board is composed of 7 groups of 7 hexes each, making a sort of flower pattern. Each hex has a small recess where one of the discs will sit. 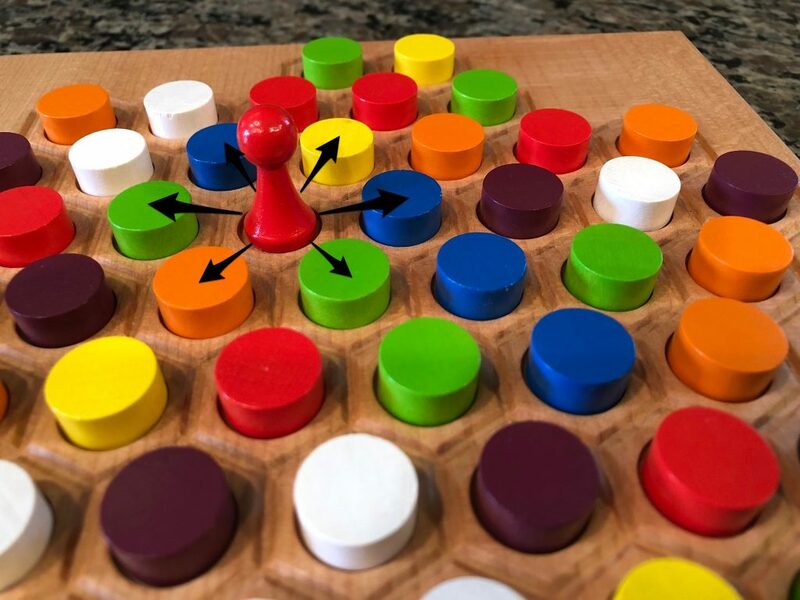 In Tintas each player is trying to collect as many of the wooden discs as they can by moving the red marker pawn on the gameboard. The game is won when one of the players collects either all the discs of a single color, or 4 discs of 4 different colors. Set up Tintas by pulling all 49 discs from the bag and placing them randomly on the board. Make sure to mix them up well and prevent too many of each color to be near each other. Choose a starting player, giving them the marker pawn, and the game can begin. On the very first turn the first player will take the disc from any position on the board, placing the disc in their collection. The red marker pawn takes it’s place. 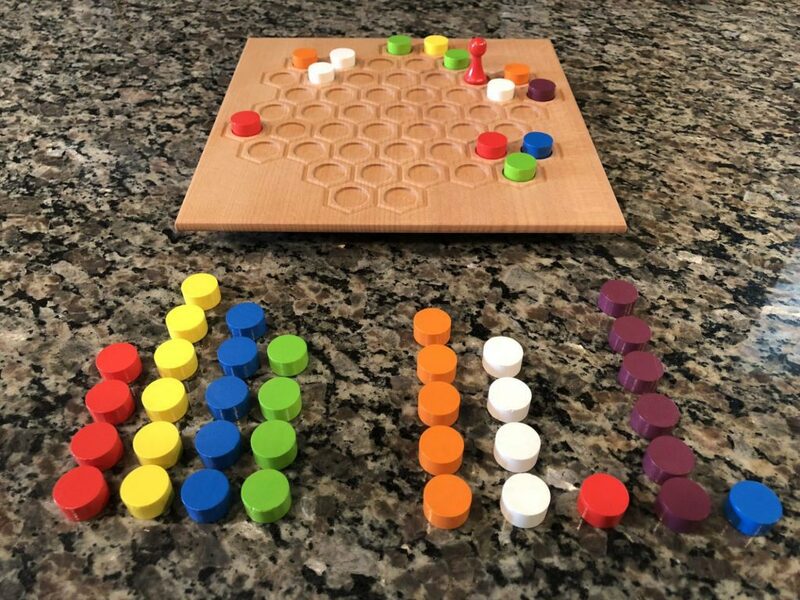 On a player’s turn they will move the red marker in a straight line in any of 6 directions, stopping and picking up the first colored piece. If another piece of the same color can be picked up by moving in a straight line from the current marker position then the player can continue picking up pieces. If the current player selects blue they may pick up all three of the blue pieces in a single turn. In rare cases, one player will not be able to move in a straight line and take a piece. If this happens they revert to “first turn” rules and place the marker anywhere the board. The game is won when one of the players collects either all the discs of a single color, or 4 discs of 4 different colors. 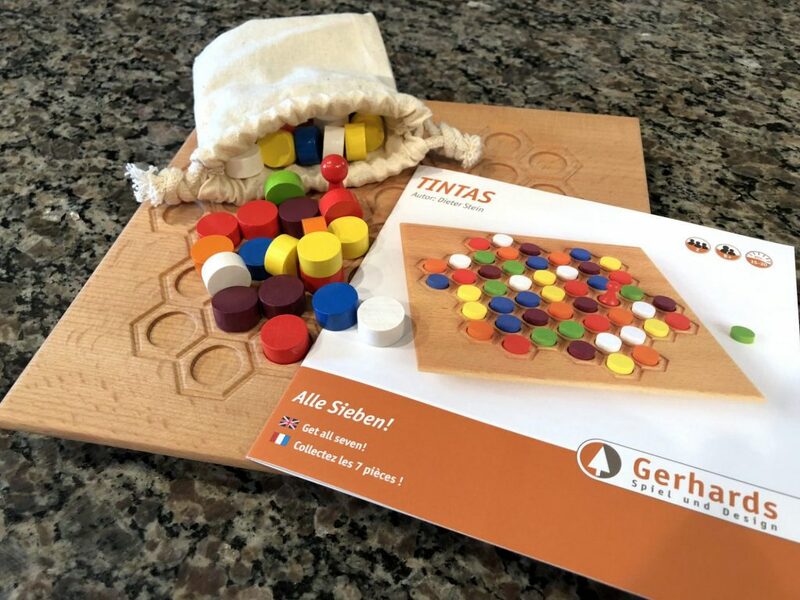 Tintas is heirloom quality, durable, and comes with a simple canvas bag to hold the pieces Unfortunately this big game comes in a small unassuming brown cardboard box. Seriously though, this game has one of the most humdrum boxes I’ve ever come across. If I hadn’t seen the game with my own eyes I probably wouldn’t have given it a second look. But nestled in the corrugated comfort of its plain exterior lies an excellent tactical two player game. Tintas is one of those rare games that is easy to play, and offers a satisfying set of choices. Games are generally less than 15 minutes which gives you time to play 2 or 3 games. There are a number of interesting decisions that I’ve found in my games of Tintas. Do you try to corner the market on a single color, or spread your holdings across multiple colors? Is it worth going for a color you need even though it will allow your opponent access to colors they need? Do you continue to pick up a color that you can’t get seven of just to deny that color to your opponent? Am I perhaps over thinking this game? I really love this game. It checks almost every box for me. Light, fast, great to look at, and portable. If you want a two player game that’s as fun to play as it is beautiful to look at, then Tintas should be on your Christmas list. Previous postFast Food Fear review – Feeding the Monsters!